Even though it said to kiss logic goodbye, the tried and true method of throwing items at puzzles still worked. 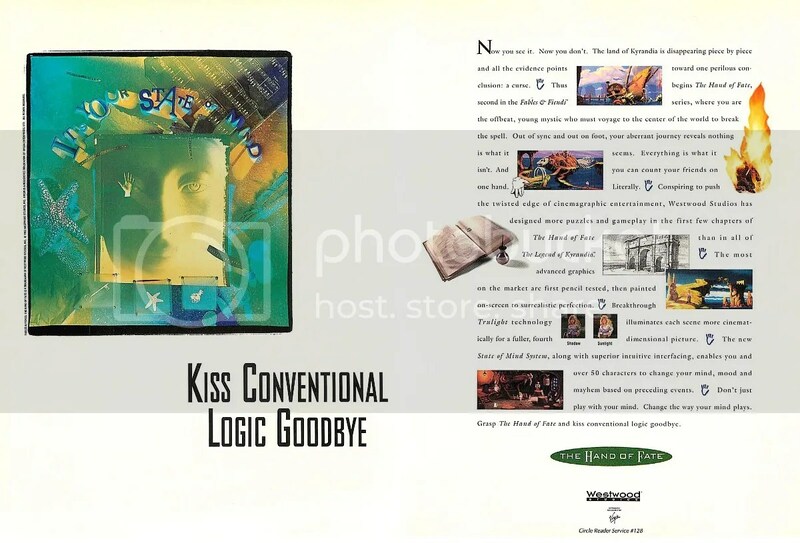 The “kiss logic goodbye” part was in why certain puzzles were where they were. Who locks up a spare part using a Tower of Hanoi puzzle, anyway? Westwood’s reputation as a defining force in RTS games has obscured the other things that they have done outside of mining for spice on Dune or directing the next battle between the GDI and NOD for Command & Conquer. They were into CRPGs having done work for SSI with Eye of the Beholder I and II and then took that experience into a new IP centered on Lands of Lore. They also did adventure games kicking things off with The Legend of Kyrandia: Book One in 1992. The sequel arrived a year later, in 1993, as Book Two: The Hand of Fate. Unlike traditional sequels and much like their Lands of Lore series, Hand of Fate didn’t start off with the hero from the previous game. Instead of Brandon, who is now king following his own adventure, this time around, players took on the role of the young alchemist, Zanthia, who briefly appeared in as part of the NPC cast now joining the ranks of King’s Quest’s Rosella and Indiana Jones and the Fate of Atlantis‘ Sophia Hapgood. It seems that Kyrandia is disappearing piece by piece — whole chunks are just vanishing. The Mystics are stumped on what is causing it happen but Marko’s assistant, a giant gloved hand, seems to have a solution. An Anchor Stone, from the center of the planet, could be the key to solving the predicament. Zanthia, the youngest Mystic, is chosen to go after it for the simple reason that the story needs her to do this. Unfortunately for her, she’s going to have to take the long way down when she discovers that her hut has been trashed and her equipment destroyed. Someone really doesn’t want her to go anywhere. Rick Gush, who handled the writing for Hand of Fate, would also work on the Lands of Lore series. For awhile, I thought that both Kyrandia and the Lands were one and the same…just that the games took place in different areas or times. Like the first game, and running as something of an undercurrent into Lands of Lore, Hand of Fate occasionally doesn’t take itself too seriously outside of the main adventure. The manual’s alchemy story can even sound a bit Pythonesque if you read it in Eric Idle’s voice. Pop culture references, such as one that speaks of a galaxy far, far away, also occasionally crop up. Science and magic also crash together in Kyrandia — Zanthia doesn’t bat an eyelid when she’s told about an exploding planet and a galactic evil — creating the impression that Kyrandia is something of a potpourri of fiction that might have been floating around Westwood at the time but never could find one game to be pulled into until this one. Players more accustomed to ‘serious’ fantasy fare, such as Sierra On-Line’s King’s Quest series, might be a little put off by how cavalier Kyrandia can be with its tongue-in-cheek humor. The manual has a story that goes into detail about the history of alchemy in Kyrandia and eventually leads up to Zanthia’s role in the game. She can mix together ingredients that she finds along the way to create special potions which are often used to solve puzzles, much like combining items in other adventure games to create the miracle gadget needed to get through to the next one. The interface has also been polished up since the last game with a little, animated stone wheel to the side to scroll through the shelves of items that Zanthia is collecting. Everything is controlled by mouse — one click usually does everything needed from picking up things to talking to people. As the ad points out, the game boasts a number of clever techniques that Westwood engineered to make this game even better than the last one from a visual sense. Truelight enables a form of lighting and shadow adding depth to scenes which were first sketched in pencil and then “painted over” with pixels. Like the first game and the first Lands of Lore, Westwood’s artists knew how to render stunning 2D scenes filled with color and imagination. Also mentioned was the “State of Mind” system which gives the impression that your actions would have consequences in the story, though the linear nature of this adventure ensured that as long as players solved their way through it, everyone would continue to play their part. There were even a few things that Zanthia didn’t actually have to do on the side but were available to the player if they so chose to do them. Despite having to many characters to chat with, it was all one way — clicking on someone started a stream of consciousness that continued if you kept clicking on them. No parsing or questions needed which might also concern veteran adventurers more used to interrogating NPCs their own way as part of the challenge. Puzzle-wise, it could vary between somewhat straightforward to brutally tough because of a number of false leads that it would leave the player. This is a game that played on the old adage of an adventurer picking up everything that isn’t nailed down — even if some of those things aren’t really needed at all. As for the ending, it turns out that the Hand was the cause of all of this mischief, though the final “puzzle” was more of an exercise in knowing where to click during a real-time puzzle. Once completed, however, the player was treated to a short ending but a fantastic credits scroll with shots of NPCs met along the way. Hand of Fate was a beautiful adventure, albeit a short one, but is a proud part of the legion of adventure titles that still dominated their piece of the PC pie in the early 90s amidst all of the changes. The initial release’s packaging was also a typical “big box” PC release with an brightly illustrated manual with screenshots on every page, a rarity in today’s day and age. The next year, 1994, would see a CD-ROM “talkie” version hit shelves. However, according to this archived interview with Rick Gush by Adventure Gamers, he notes that it only sold half as many as the first game because thanks to disastrous marketing. He also points to the “nuclear explosion” box which was colorfully illustrated with photo negative, x-ray effects on a hand, though if you didn’t know anything about Kyrandia from the first Fiends and Fables title, you might have no idea what this was as a huge contrast to the fantasy cover given to its predecessor’s box. Though the game didn’t necessarily revolutionize adventure games, Westwood wasn’t shy about trying new things and in attempting to be the best at them as the art in the game amply demonstrates. Today, you can snag it on Good Old Games, a survivor from a time when big studios were still unafraid to tease fans with strange adventures in more than one genre.